I love doggie doors! If you have a dog door or you’re able to install one, your housebreaking program will be much faster and easier, since your dog will be able to take himself outside every time he needs to go potty. He’ll never have to wait for you to notice that he needs to go outside, which will make him happy, and you’ll be able to have a lot more flexibility in your schedule, which will make you happy! Owners with dog doors are able to relax, knowing they don’t have to rush home to let the dog out since he can handle it himself. They also generally find that they’re able to give your dog more freedom in the house sooner without worrying that he’ll have an accident. Beautiful! You should really read our first article, Housebreaking Training, before starting with your doggie door training. The article has a lot of good general information about indoor supervision, setting up safe areas and teaching your dog to hold it. And if your dog isn’t comfortable going through a doggy door yet, read Teaching Your Dog to Use a Dog Door before following the housebreaking program below. Of course, a dog door is only an option if you have a safe outdoor area that your dog can have access to without escaping or getting himself into any other kind of problem. The dog door can lead to your entire yard, an enclosed dog run in your yard or an outdoor balcony or patio where your puppy’s allowed to potty freely or on papers or in a litter box. If you have any doubt about whether your dog can escape, please be sure to dog-proof your yard and fence before allowing him to go outside alone. Your dog can fit through a smaller opening in your fence than you’d think, so if there’s any doubt, add boards or chicken wire to prevent him from making a break for it. The first step in housebreaking your dog using a doggie door is teaching him to get through the door. Once he’s comfortably able to get in and out, your training program can commence. If your dog has no clue that he’s supposed to go potty outside and that he’s not supposed to go inside, he won’t just naturally start doing the right thing, so we have to motivate him to go through the door each time he needs to go out. The best way to encourage this behavior is to be sure you take him out through the dog door each time you take him to the yard. You’ll also need to make sure that he has access only to a very small indoor area right inside the dog door when he’s left alone. The next section will teach you how to set up your dog’s indoor area. If you have multiple doors in your house that lead out to the yard, it can be tempting to take your dog through the nearest door, since it’s convenient for you. This may cause confusion for your dog; you might find that he begins to have accidents right inside one of the other doors you’ve been using to take him outside, since he went there with good intentions and tried to get out but there was nobody to open the door. If he’s in the habit of always following the same path to the doggie door, he’ll learn much sooner that he can get outside on his own without having you as his own personal doorman. The best way to get your puppy to want to eliminate outdoors instead of in the house is to give him access to only a small indoor area right inside the dog door when he’s left alone. This area should be just large enough to fit his dog bed and his food and water bowls. His natural tendency is to want to keep his bed clean and not want to go potty where he eats, so he should have enough of an aversion to going in that small area that he’ll start taking himself outside to potty – as long as he’s been taught in advance to comfortably go in and out the doggie door. Remember, this area has to be quite small in the beginning for this method to work. SAFETY NOTE: Your dog should never wear a collar when left unsupervised in his confinement area, because he could get it caught on any number of things, especially if he attempts to escape. You must be absolutely sure that your confinement area is secure, as an escape attempt could injure or even kill your dog. If your dog door is in a bathroom, laundry room or other small room in your house, enclosing him in that room by closing the door or using a puppy gate will probably be sufficient. If he still has a bit too much space, even in this small room, you can use a puppy gate or exercise pen to block his access to part of the room. If your doggie door is in a larger room, you’ll need to use an exercise pen – a multi-panel gate that can be assembled to create enclosed areas of different shapes and sizes – to make an enclosure of the proper size just inside the dog door. Typically, the best way of doing this is using as many of the panels as you need to create a square that uses the wall or door with the dog door in it as one of the sides – or you can make a semi-circle with the exercise pen just inside the dog door. You’ll need to secure the pen to the wall or door so your dog doesn’t just push his way around the pen and run wild in your house. With smaller, less active dogs, putting some heavy objects against the sides and ends of the pen will do the trick. With larger or more active dogs, you may need to head to the hardware store to buy some eye hooks to put into the wall or baseboard. You can then secure the gate to the wall using zip-ties for a permanent solution, and snaps (like the snap on your dog’s leash) for a quick-open solution. Many exercise pens have a panel with a walk-through gate that you can open and close, which is a convenient feature to have if you can get it. If your gate doesn’t have that feature, be sure at least one side of the gate is secured using snaps so you can open and close it easily if you want to have him out in the house or put him back in his pen. Another option that may work in the first phase of training your dog to go out through his dog door is to push his crate, with the door open, up against the dog door so he only has access to his crate and the yard. If you use this option, please be sure to secure his crate up against the dog door by placing a very heavy object behind it or by using snaps to attach it to eye hooks in the wall. If you don’t secure the crate very well, your puppy will most likely push it away from the wall and escape to pee and poo freely all over the house, or worse, hurt himself while trying to escape. When you find that your dog has reliably kept this small confinement area clean, you’ll be able to start expanding his space gradually. If your dog is more than 6 months old, you can trust him with more space after he’s been clean in the small confinement area for about a month. If your puppy is less than 6 months old, we recommend keeping him in the small confinement area until he reaches 6 months, then gradually adding more space. More space can be added by moving your puppy gate if your dog has been closed in a bathroom or other small room. You can add on the nearest room or hallway by moving the puppy gate. You can add another small area each month until you find that your dog is reliably going out his dog door from every room in the house. If your puppy’s confinement area is an exercise pen, you can make the area larger by adding more panels or even by attaching a second exercise pen to the first to make an extra-large pen just inside the dog door. Once he’s reliably keeping this larger pen clean, you can start using a puppy gate to open the whole room for him, then add rooms as outlined above until your dog can reliably have access to your whole house. While you’re training your dog to use his dog door to go in and out, continue following the basic rules of housebreaking when he’s not in his confinement area. When he’s in other areas of the house, supervise him directly as outlined in Commandment #7 or practice umbilical cord training. If you ever see your dog looking like he’s trying to get away from you or get to his dog door, walk him over to the door and give him a chance to go out. Leaving the puppy gate down or one end of your exercise pen open while he’s out in the house with you will allow you to get him out the door more quickly. In the later phase of training, when your dog has more free access to the house, be sure you leave the gate or exercise pen open so he can get to the dog door! If the gate is closed and he can’t get out, he loses the opportunity to do the right thing and will almost surely have an accident. The PetSafe Freedom Dog door is a reasonably priced basic option that comes in multiple sizes for dogs up to 100 lbs. People with sliding glass doors often think they can’t have a doggie door, but this patio panel pet door is one of the easiest doors to install! You’ll want to go with an electronic dog door if you’re trying to keep wildlife out or your cat in, since it only opens for your dog. This one can be installed in your door or through a wall. If you want to install your dog door in a sliding glass door but have concerns about wildlife getting in or your cat getting out, this is the dog door for you… it only opens for your dog! If you don’t have a convenient door to install a dog door in, this wall-mount door is a great solution! This exercise pen has a walk-through gate and comes in several heights (if your dog’s a climber, get a tall one!). Can be used in multiple configurations as a pen or room divider, or be connected to a second pen to create a large play area. Want to be sure you’re doing everything you can to help your puppy have a peaceful night? 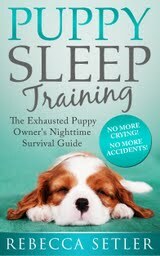 Buy Rebecca’s instant download e-book, Puppy Sleep Training – The Exhausted Puppy Owner’s Nighttime Survival Guide! © 2006-2017, Rebecca Setler, The Housebreaking Bible. All rights reserved.